Vans teams up with the Star Wars brand once again, this time exploring the dark side of the Force to introduce new designs inspired by villains from the original trilogy. Taking cues from the summer collection, the Vans x Star Wars holiday offering extends through Classics footwear to men’s apparel and accessories combining heritage Vans prints with Star Wars villains from around the galaxy. The sophomore collection kicks off with the Era, which introduces the storm camo, a black and white winter camouflage shoe featuring images of Imperial Stormtroopers. 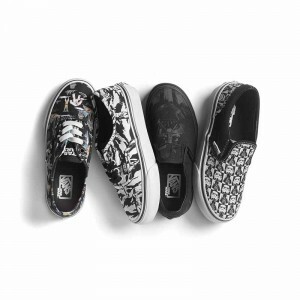 The blended Star Wars and Van Doren Pirate print returns this holiday after first being released for a limited run in the Vault by Vans collection. The archived Vans print has been updated replacing the original skull and sword configuration with images of Darth Vader, Stormtrooper helmets and lightsabers. The reissued Vans x Star Wars graphic is highlighted on a black-to-the-floor Sk8-Hi and is carried into men’s apparel with a t-shirt, three snapbacks and backpack. The Classic Slip-On mirrors the sinister, all-black motif with a portrait print of the Sith Lord himself, Darth Vader. The Authentic rounds out the assortment with a scene of good versus evil, presenting iconic imagery from life on ice planet Hoth. Kids and toddlers will also get to walk on the dark side with takedowns of the adult Era and Authentic prints, but will receive an exclusive pattern on the Classic Slip-On. Vans’ iconic black and white Checkerboard Classic Slip-On is treated with Darth Vader and Stormtrooper heads in each alternating check. 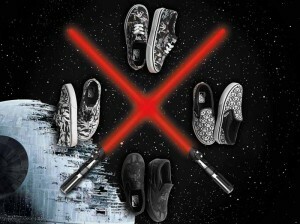 To celebrate the second installment of the Vans x Star Wars collection, Vans Customs will release limited edition Star Wars prints exclusively on vans.com/customs. 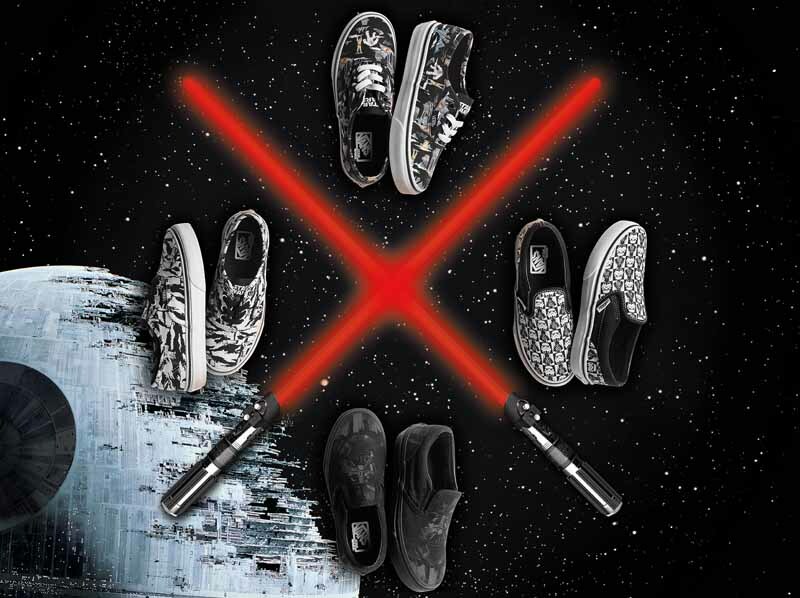 From October 15 to November 15, Vans and Star Wars fans can customize popular silhouettes such as the Authentic, Classic Slip-On and Sk8-Hi with two new patterns only available through the Vans Customs program.